Hey Backdoc, I see what you mean about this wanting to be found thing. Seems like a lot of obfuscation around it just like you were saying. Thanks for the article, It does state how an autistic child can get fixated on leaving a safe and secure environment. The quote you used above is in the context that when they want to leave, they keep trying. Not in the context that they want to flee all people. The article is also based on a child lost in NY City.. Love the pictures they post all over the place and it took how many people how long to find this lost person? A reasonable basis for the search area based on real world understanding. Tommy Lee Jones US Marshall has a basis for what is needed in the massive search for one man on the run. The terrain, being on foot, and so on. That sound is the crickets I expected to hear. Watch this detailing the search and putting a real feel to the effort needed and you tell me what it takes to find a missing boy. You watch this and then tell me the wilderness of the USA has been explored. Honestly I don't think one relates to the other. It only takes one tracker to find a person on the run, but that would have nothing to do with the wilderness of the US being explored. I don't really follow the belief of "With all the people looking for Bigfoot, he would have been found by now." However I do think that it's only a matter of time before the question will have to face technology. The more technology improves and becomes cheaper there will really be no excuses for it not to be found. Thermal video will be affordable, drones will become far more advanced, etc. It's only a matter time before we'll be able to see right through large forested areas with remote cameras and drones. Maybe even via satellite. No doubt tech advances will help. The future looks bright. Consider again these searchers for the boy posted in post #34 did have great tech including old school tracking dogs with the boys scent and they did have much of this new tech if you read other articles related to this search. I agree we r just starting to see great breakthroughs in methods of tech and the cost keeps coming down. That in time will help determine what is in the woods as it will become easier to see the woods. No different than a scan at the hospital now vs doc from Gunsmoke methods to examine a patient. What will be will be great. What is is still limited based on the search for the boy. The idea this great wilderness will be known someday seems pretty reasonable. The idea it is presently known is not true yet. Once again, wildlife biology is not voodoo and 42 monitoring stations and a team of researchers working over three years can deduce that in fact one single wolverine lives on Mt. Adams in the GPNF and has neither mated nor produced offspring during that time. Awesome. 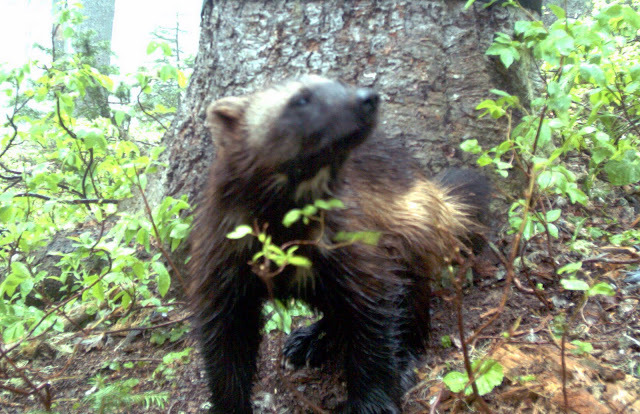 This project locates a single wolverine existing in the Cascades which they get multiple shots of from remote survey stations over a huge area, and it is a huge boon for the project. That's a single medium sized mammal far outside it's normal range. Yet here there is supposed to be a population of Bigfoots living and thriving and nothing. Or maybe survey stations did record the Bigfoots but The Man is keeping the stunning truth down. Bigfoot - not so much. "ABC NEWS: "As near-freezing temperatures threatened to set in at nightfall, more than 1,000 volunteers spent today searching rugged Virginia woodlands for a 9-year-old autistic boy who has been missing since Sunday. Carrying walking sticks and wearing yellow reflective jackets, the searchers began lining up before dawn to be taken to the forest where they were to look for Robert Wood, Jr.
"I have an 11 year old, and if the situation were reversed, I would hope people would be out helping me look for her," said a man named Don who stood in line for hours in the parking lot of an amusement park to take part in the effort to find the boy. Hanover County sheriff's officers say Robert, who does not speak, ran off from his father while they were visiting North Anna Battlefield Park on Sunday. After five days, the search has been fruitless. Some areas of the park have been covered by search teams at least twice. With weather forecasters predicting temperatures in the upper 30s early Friday morning, the effort took on new urgency today. "We are not giving up," Hanover County Sheriff's Capt. Mike Trice said today. "Our mission is clear." Trice acknowledges after several days of mild temperatures, it's going to be very cold in the woods early Friday morning. "We are in a life-saving mode, definitely," Trice said. Officials have broadened their search area to a 3.5 mile radius from where the boy was last seen, up from 2.5 miles. They have also stopped the flow of water into the North Anna River, to aid divers in their search of the water. Specialized teams will use infrared, thermal-imaging and night vision technology as they continue looking for Robert overnight. The number of searchers has also increased. "They said they needed more volunteers today because time is of the essence," said Stephanie Saccone, a Richmond resident who had been watching news coverage of the search all week. Eddie Buchanan, division chief of Hanover County Fire/EMS, told ABC News that so many volunteers showed up to look for Robert today that hundreds were sent home after receiving training, in the hopes they would return tomorrow. No searcher goes into the field without receiving protective gear and being taught by an autism specialist how to interact with Robert, should they find him. "It's so that they understand that in case they do get lucky and encounter him, how to handle that so they don't scare him or make things worse," Buchanan said. "We know that he's quite a runner, he's quite a climber, quite a fast little guy," Buchanan said, but Robert's parents tell officials he won't respond when his name is called. "It's such a rough terrain and such a rough situation," said Carrie Christ, a firefighter and paramedic who drove 60 miles from York County, about 60 miles east of Hanover, to take part in the search for a second straight day. "I don't know why they haven't found him. They're making every effort." "We believe that Robbie's out there. We believe that he's alive," Buchanan told ABC News. "We're going to keep searching and doing everything we possibly can, for as long as we can, until they tell us to stop." I agree in time all the gadgets and so on will continue to reveal information and reveal what is in the woods. Just wanted to be clear special teams did have some of this stuff. I don't think we can underestimate the effort applied in this case, and weight this effort when considering a search for Bigfoot. So, based on your link, bigfoot does not exist because he would have been searching through garbage cans in the Burbs by now? I take it your have not heard about the people who have contended in certain encounters out on the edge of the wilderness he/she has been reported to have done just that. So a massive search is conducted for a boy illustrating in real objective terms what it would take to find a lost biped --Robbie Wood Jr. Yet, your answer to this effort it to say Bigfoot should be Habituating by now? Any comment on the actual event and the numbers and effort needed? By the way, when they were looking for the Moutain Gorilla back in the 1800's how often did he come to town and look through trash cans? Thank you all for your attention on this issue. The mountain gorilla was discovered by people not looking for it. A German lead expeditionary team visiting outposts in then German East Africa. Hey, what are those? Bang. Mountain gorillas discovered. That was Europeans nosing around in Africa. In 400 years of the same occurring in North America, never once has this demonstrably occurred. All of the four extant great apes have been habituated in some fashion. The BFF has numerous members who will tell you of doing the same with Bigfoot. On this same day in this same subforum I am talking to bf2011HBMay. Mr. May is a very pleasant fellow, I like him very much, and he is a popular and respected Bigfoot enthusiast. Mr. May has two personal sighting encounter stories. One is of seeing a dirty white Bigfoot in front of someone's house in an unwooded section of Highway 61 in Mississippi which he was driving on. The other was seeing a Bigfoot from his own patio at his home in Georgia. I do not think Mr. May is lying about these encounters, though I do not think he saw a Bigfoot in front of someone's home and another from his balcony. Meanwhile, another Bigfoot enthusiast in this thread is talking about how hard it is to find Bigfoot in all that remote wildrness. Mr. May's Bigfoots and your Bigfoots need to talk it over, because they are not on the same page. Bigfoot does not have to be looked for to be found. We've had four hundred years of people doing all manner of things that can lead to Bigfoot being catalogued. The first Bigfoot that screams or chucks a pinecone at gun-wielding Europeans nosing around North America would get ventilated, little lost autistic boys notwithstanding. Mr. Mays Bigfoots are not little lost children. They're walking smack in the middle of human civilization. Not one person need ever lift a finger looking for Bigfoot. Bigfoot is coming to us. ^^ That last statement is actually correct. Its like in Russia- you don't find Bigfoot, Bigfoot find you.